Part of a series inspired by a quote, 'Perfect love drives out all fear'. 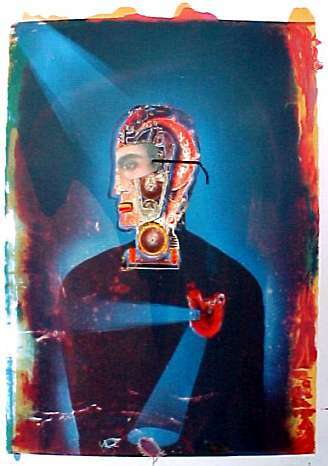 Light shines on a character made up from a mask, and other mechanical and scientific elements. Light shines through the heart outwards and also shines inwards revealing some creepy crawlies. I had been using creepy crawlies and bugs inside of people to represent corruption, infestation, some things that are not as pleasant on the inside. Things that live in darkness, under a rock, or that would scurry away from the light. When light shines on you and through you it can be a revealer of unpleasant apects of who we are and some things that we keep hidden or that are hidden from us. It drives out some of these creatures that move away from the light.